As the world becomes ever more globalized, the humanitarian policies and methods of governmental and non-governmental organizations are changing as well. In the midst of these changes, what role does religion play? How does belief impact action—and how does action impact belief—in the evolving world of humanitarian work? These complex questions will be at the heart of the 2016 Bridge/Work conference, hosted by the Institute for Leadership and Service at Valparaiso University. 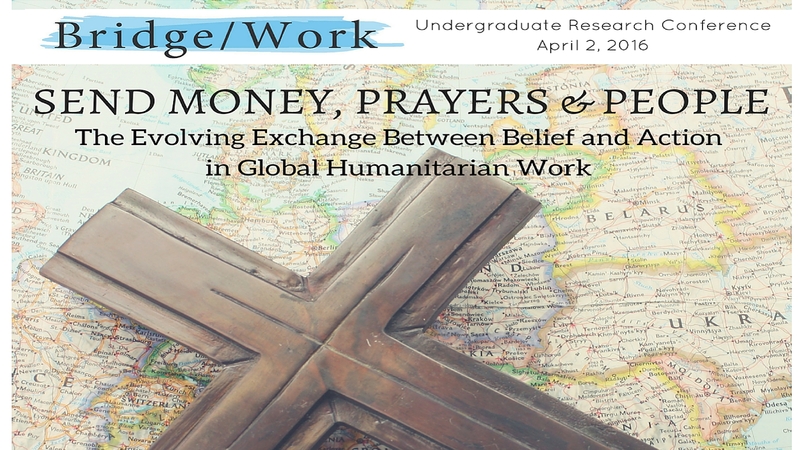 Through a mix of keynote addresses, undergraduate research presentations and practitioner panels, conference attendees will explore how religious belief and value commitments shape and are shaped by humanitarian work at all levels, from policy formation to ground-floor implementation. How do we do good work well in other countries? How does religion help or hinder such work? How are religious belief and action at work in humanitarian responses to current refugee crises in Syria and elsewhere? What trends and patterns do we see in faith-based giving in response to humanitarian crises? How does faith-based philanthropy change--or how has it changed in response to secular philanthropic trends and models? How have specific religious traditions framed and fostered humanitarianism? How has humanitarianism changed religious faith and action in the world? How have the religious commitments of philanthropists, from the famous to the less familiar, informed the way they donate their time and resources? Do religious commitments limit or enlarge the amount of good they do?